I love to watch movies! It’s one of the many things that I enjoy and soothes me when I am stressed out. However, I have favorite movie theatres I like to go for certain reasons. Below are three of the closest theaters that can serve different purposes for your movie experience. This theater is probably the closest one to school. It is behind the Windsor marketplace and has ample space for parking (extremely important when you are running late). This place is perfect for those moments you don’t want to mess with the massive amounts of people at the theater. I have been able to watch a couple of movies with nobody else in the room except my friends and I. This is perfect for times when you have to watch extremely emotional movies. I would rather no one ever know that tears had fallen from my eyes. The seats are comfortable but don’t expect the comfort of a Lazy-boy. The rooms are always clean. The ticket stand and the snack bar are the same, so be prepared when you buy your ticket to know what you want to eat. 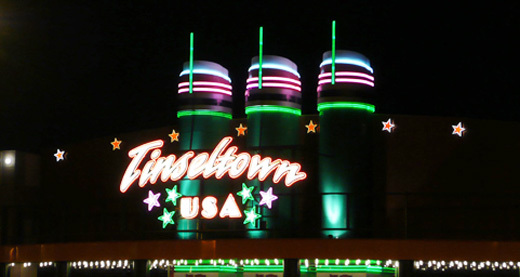 Out of all the theaters, Tinseltown is probably the best place to benefit from a matinee. Their regular prices are around $7 for an adult, but anytime before 6 pm a ticket is $4.40. Also, they are currently hosting Discount Tuesdays where all day the price is $4.40. This theater is a little far away compared to B&B Windsor. It takes about 15-20 minutes to arrive at the theater, which is twice the time from B&B theater. However, it’s sometimes worth it to save those extra couple of bucks for other movies. Buying tickets and snacks tend to be fast because they have multiple booths open. So, if you are running late they will provide fast service! The theater rooms are clean but you will be surrounded by people as this a bigger theater that attracts more people. If you want an incredible movie experience, AMC Penn Square is the place to go. This theater has plush recliners for every seat. You can even fit two people in one seat! You get two cup holders per arm rest, so you don’t have to fight the person sitting next to you to see who will be able to set their drink on the right armrest. You do have to be prepared to pay for this experience. Tickets are usually about $13. There is one ticket booth at the front so at times the line can be very slow. Do not show up late (I tend to be late for many movies). Many recommend that you reserve your tickets online hours before the movie, especially if it’s a new release. The snacks are great here! You do serve yourself your own drink, and this is not bad. However when you have several people doing the same, the lines tend to be long. Also, the movie theater is in a mall so you can find parking, just maybe not extremely close to the theater. I recommend you visit these theaters at least once. Not only do you know get to know the surrounding communities a bit more, you can also experiment and see which one you like the best. Find what you like best from a movie theater and what makes you feel comfortable.